The talented and lovely Cynthia’s choice is up again. I am loving her right now because her original choice was water marbling for today but thankfully she came to her senses and chose Gradient. Looooook at all those colorsssss ❤ So what do you think about these flakies or more importantly, Electric Carnival? With that being said, I had totally forgotten that today was our bi-weekly post and almost wasn’t able to participate. I decided that I would at least do a quick 4 finger mani because I couldn’t be late again 😦 lol This month is Amy’s pick and for her color she chose Teal. I have so many teals to choose from however one sticks out as my favorite and was a quick dry, so win-win. I painted one coat of OPI’s Fly just to have some undies and then one thick coat of Shimmer’s Strength. This teal beauty can either be worn with undies or on it’s own. Stand alone takes about 2-3 coats or just a few thick ones to become opaque. With the undies this was just one coat of Strength. So what do you think Super glittery right, how can you go wrong! What’s your favorite teal, or perhaps if not a teal what is your favorite go-to color? OPI is back at it with their 8th Annual limited edition Breast Cancer Awareness duo in support of Breast Cancer Awareness. This years set includes a pink entitled Mod About You and this gorgeous pink cream jelly with various pink and white glitters suspended in it entitled The Power of Pink. The pink jelly can be worn on it’s own (takes about 2-3 coats to be opaque) or over-top Mod About You. 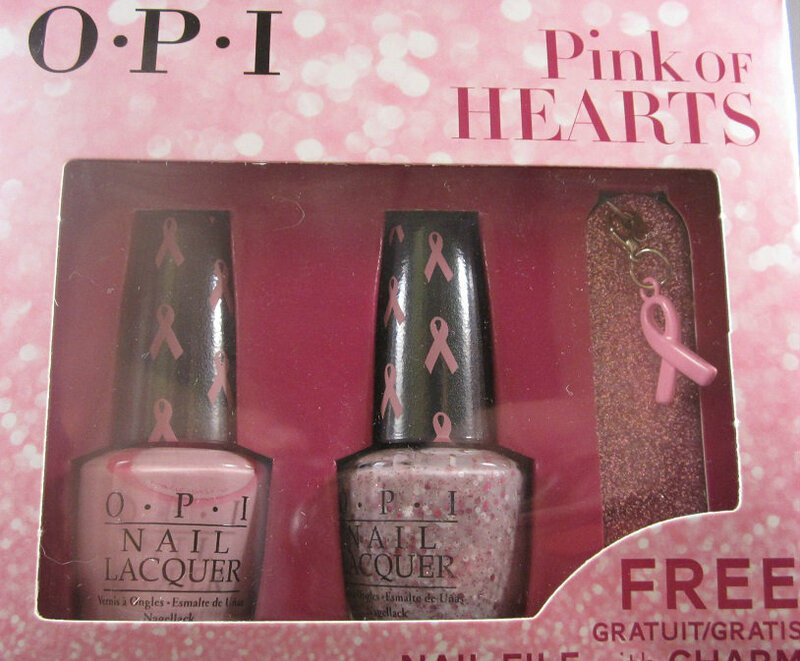 The set comes with a pink glitter nail file with a breast cancer charm. This year OPI will donate $25,000 to the Susan G. Komen Foundation (US) and $5000 to Rethink Breast Cancer (Canada) in support of Breast Cancer Awareness Month. The Set retails for $16.95 but you are in luck! I have a set to giveaway! First check out my swatches of these beauties. I did two coats of Mod About you on my ring finger for accent and I stamped Orly’s Miss Conduct using my ribbon stamp. I did two coats of The Power of pink on the rest of my nails. Open to Mae’s Beauty followers only. Must be 18 years or older. Open Internationally. Giveaway starts now and Ends Friday November 24th at 12Noon EST prize will be mailed out Saturday 25th. This is two coats of Philly Loves Lacquer’s Saturnalian. It’s a gorgeous blue with grey scattered holos and rainbow micro glitters, also super high shine. How can you not go wrong! Saturnalian is a part of the Fancy Brigade Mummer’s line. If you are not familiar with the Mummers or Fancies she has some info about it under the polish description. So I leave you for now but will schedule out another post of my gorgeous and first ever Illamasqua!!! I LOVE it wait till you see this color. And of course don’t forget about the upcoming giveaway! With the sudden loss of America’s beloved Robin Williams there is finally more light being shown on Mental Health of all kinds. It hits very close to home for me as several very close family members suffer from different types of depression. On FB and Instagram there is a green mani day to show your support and help raise awareness for Depression/Mental Health. You can see the details here. My hope is that people suffer from depression seek help. It is so hard sometimes to realize how bad your depression has gotten the deeper you go, just remember you always have support and there is NO shame in seeking help! PLEASE DO! So what do you think of this gorgeous green? 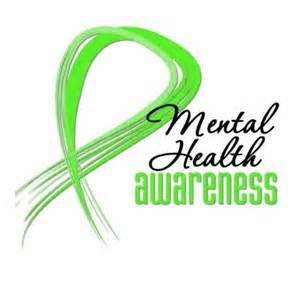 Will you be showing support and helping to raise awareness for Mental Health this Sunday 8/17/14 ? For this mani I painted two coats of Morgan Taylor’s Prettier in pink. Before I stamped, I also topped the pink with China Glaze’s Travel in Colour. 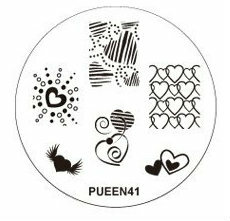 I stamped Ulta’s Snow White using PUEEN36 stamp. AS I TYPE this post, I just got the call that she’s finally been admitted! She’s been having contractions all week and they wouldn’t take her… AZ is very strange! WOOHOO the nails worked!! As you read this, I am down the shore… or for those not on the East Coast ‘At the Beach’. That means I prepared in advance and did my post and had my nails ready! Wow that never happens anymore! I don’t think that the link is available yet, but be sure to go on one of the other girls pages to see everyone’s Stamping Saturday look if I don’t get time to change and add it!